I awoke on Sunday to an absolutely beautiful spring day for the northeast. The sky was blue and the air was warm. I knew that after the warmth & rain of the last two weeks that the ground that had never really frozen hard this winter would start to be soft & pliable. 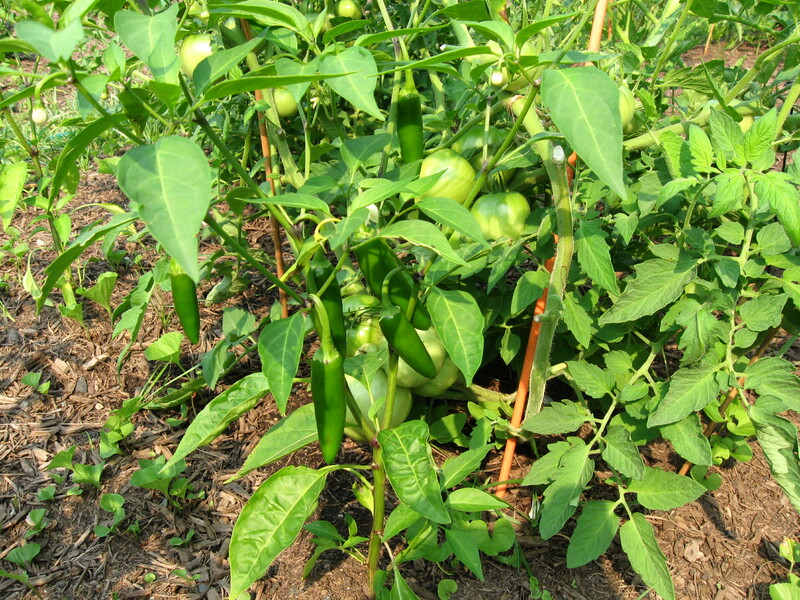 I knew it was going to be a great day to start working on the 2010 version of my vegetable garden. I have a large garden out back at the edge of my yard back by the brook. I have outsized expectations every year for my farming prowess but that discussion is for another time. Be that as it may, I was out in the garden turning the dirt by hand with my four pronged Hound Dog T-Square Garden Cultivator while listening to silence all around me. It was filled with the birds chirping, the brook babbling and the occasional Sunday driver cruising our dead end street. I could feel the breeze that was lightly moving the branches in the trees above me causing them to make a slight clicking sound. I could sense more than hear the occasional jet passing by overhead on it’s approach into the New York area. Suddenly the afternoon exploded with the sounds of our neighbor’s two dogs barking & yapping as loudly and as much as I had ever heard them. My first inclination was that they had seen a wayward squirrel or that perhaps a deer had wandered onto their side of the brook but the barking became louder & more persistent. I began to wonder if perhaps they had something cornered. The smaller of the two dogs seemed to be especially agitated. His yapping was reaching an unprecedented crescendo. It was at that moment that a fox with a fantastic golden red coat and thick white tipped tail slipped out of the bushes on the far side of the clearing down by the brook. I knew this particular fox as I had seen him many times before as I gazed out my kitchen window with my coffee mug in hand. I called him George. He had what looked like a small rabbit in his mouth. George stopped just as he emerged from the brush and he looked at me. Then he looked back at the distant sound of the still barking dogs and then he looked back at me again. I hadn’t moved. Our eyes met for just a second before he darted across the clearing and disappeared into the tangle of overgrown brush. A minute later I caught a quick glance of George through the trees. He was on the other side of the brook and he was briskly heading for the field on the far side of the woods. The barking finally slowed and then stopped. I went back to turning the dirt and listening to the silence with a bemused smile as I thought of how George had once again given his pursuers the slip. 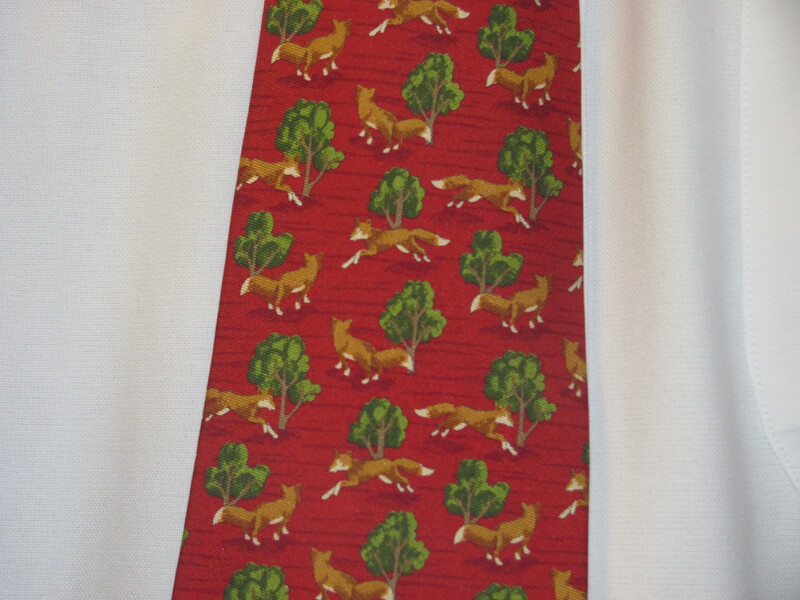 So I chose my fox tie today as a subliminal tip of the hat to George.